Remove the stem and cut the cauliflower into small bites. You decide how rustic or fine you like it. Then simply assemble the salad with the chopped almonds, cherries and parsley. Pour the olive oil straight onto the salad, then add zest and squeeze the lemon. Give it a good stir. Season with salt & pepper. Taste, serve, enjoy. 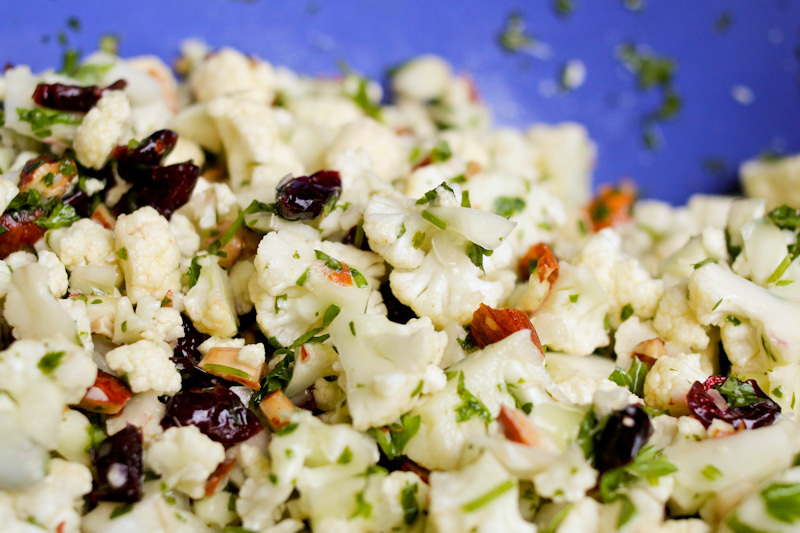 This entry was posted in Salads & sides and tagged cauliflower recipe, Claus Meyers blomkålssalat, opskrift på blomkål, rå blomkålssalat, raw cauliflower salad, raw salad recipe. Bookmark the permalink. This sounds so much better than just dipping it into a ranch dressing. I’ll have to try it! You always can make it simple and taste so much better. Love it! I thank you my loyal supporter I hope you like it as much as I did! This was a hit except for Michael of course, my picky eater!! Ingrid liked it too.